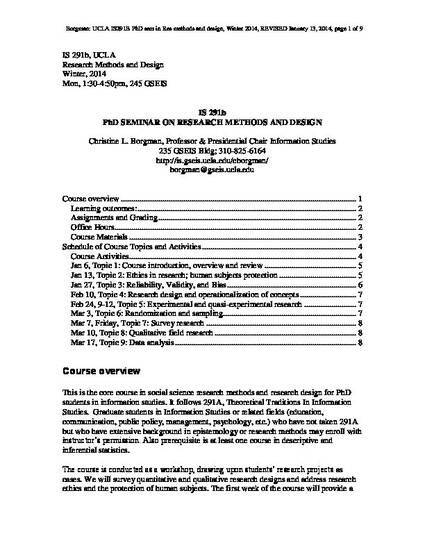 This is the core course in social science research methods and research design for PhD students in information studies. It follows 291A, Theoretical Traditions In Information Studies. Graduate students in Information Studies or related fields (education, communication, public policy, management, psychology, etc.) who have not taken 291A but who have extensive background in epistemology or research methods may enroll with instructor’s permission. Also prerequisite is at least one course in descriptive and inferential statistics. The course is conducted as a workshop, drawing upon students’ research projects as cases. We will survey quantitative and qualitative research designs and address research ethics and the protection of human subjects. The first week of the course will provide a brief review of epistemological issues, basic concepts of research design, and a refresher in statistical concepts. The course is intended to prepare students for further study on specific methods and to assist in preparation for the PhD qualifying exams. Students will begin to build their personal libraries on research methods via the course readings. Materials include popular textbooks on social science research methods and the primary publication manual for social science research. Students will develop a research project and will present an analysis of research reported in a journal article in class.